Anton Paar Spain is located in Madrid and Barcelona. 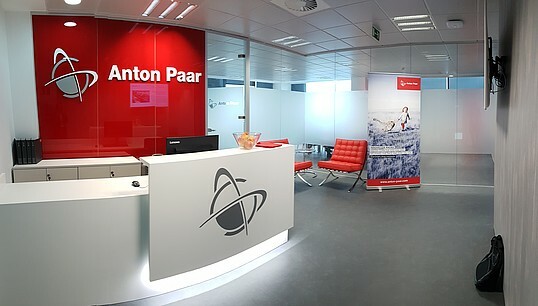 "In both offices, there are laboratories with measuring equipment so that Anton Paar's technology can be tested first-hand," Luis López-Villalta, managing director at Anton Paar Spain, says. Anton Paar Taiwan is located in Nangang District in Taipei. "On our 500 m2 location, our experienced team is offering application seminars and immediate service to our customers," Allen Wu, managing director at Anton Paar Taiwan, says. Founded in 1922 in Graz (Austria) by Anton Paar, the Anton Paar Company is the market leader in the measurement of density and concentration, the determination of dissolved carbon dioxide, and in the fields of rheometry and viscometry. Additionally, Anton Paar offers measurement solutions for optical analysis (polarimetry, refractometry, Raman spectroscopy); petroleum properties (flash point, plasticity, consistency, and more); particles, pores, and surfaces (including atomic force microscopy, X-Ray scattering, Zeta potential, particle size determination). Microwave technologies and process instrumentation complement Anton Paar’s product portfolio. The company’s customers include most of the major beer and soft drink manufacturers worldwide as well as companies active in the food, chemicals, petroleum, and pharmaceutical industries. Once established as a one-man locksmith’s workshop, Anton Paar strives to combine high-precision manufacturing with the latest scientific achievements; the Anton Paar GmbH invests 20 % of the annual turnover in research. More than 170 analytical solutions are developed and produced almost exclusively within the company. Today, the Anton Paar Group is active in more than 110 countries with 31 sales subsidiaries and seven producing sites in Europe and the USA. Meanwhile, more than 3100 employees in a worldwide network of research and development, production, sales, and support are responsible for the quality, reliability, and service of products made by Anton Paar. Since 2003, the Charitable Santner Foundation is the owner of Anton Paar. It is dedicated exclusively and directly to charitable purposes. In 2017, the company generated a net sales revenue of 309 million Euro.